A few years ago, the Insurance Institute for Highway Safety started doing a new kind of crash test, meant to check how safe a car is when hitting a thin obstacle in the front corner, called the small-overlap crash test. 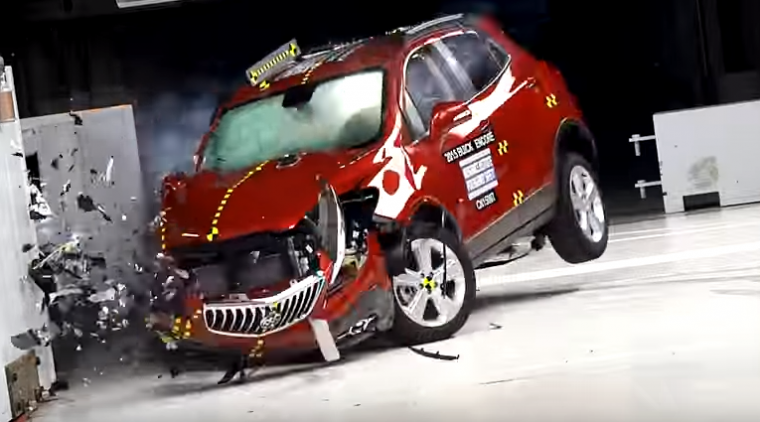 This test led to a mad scramble among automakers to improve their crashworthiness in that area, and is generally considered one of the IIHS’s hardest tests. However, it seems that wasn’t quite enough, because as the IIHS has noticed, it has just led to automakers reinforcing the front left corner, the one which the IIHS usually tests. So, possibly starting with the 2018 model year, the IIHS has announced that it will be performing a new small-overlap test—this time for the passenger side, and any vehicle that a carmaker wants to earn the highly coveted Top Safety Pick+ title has to score at least an “acceptable” rating. This change is the result of a study that the IIHS ran last year on seven small SUVs (currently the hottest-selling vehicle segment on the market) that had earned “good” ratings on the regular small-overlap test, which repeated the test on the passenger side. Only one of the vehicles managed to repeat the “good” performance. Otherwise, it seems that a crash on the passenger’s side led to way more passenger-space intrusion, leaving most with only and “acceptable” or “marginal” rating (and one “poor” bringing up the rear). The good news for passengers right now, though, is that although intrusion levels were worse, they weren’t too bad—apparently, according to IIHS Senior Research Engineer Beck Mueller, the biggest issue was optimizing airbag and seatbelt performance. We’ll be looking for these new tests as the next model year begins to be released.